There are 3 posts in this thread, and it has been viewed 2641 times. GunForce II / Geo Storm. What do you think of it? Let's start off 2018 with a blast from the past! Just as with In The Hunt, the developer team under Irem that later became Nazca, famous for Metal Slug and Neo Turf Masters, already proved their run 'n' gun expertise in GunForce II. 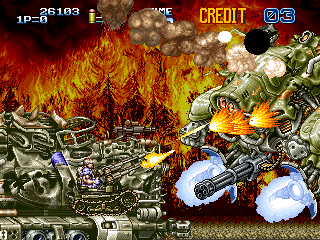 While the first game from 1991 didn't really stand out, the 1994 sequel was highly acclaimed for its detailed sprites, crazy bosses, non-stop action and screen-filling explosions. 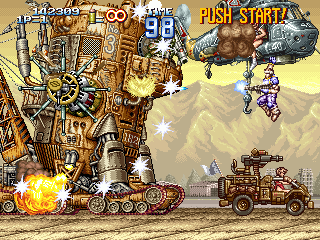 Nowadays it's considered the spiritual predecessor to the Metal Slug series, not only because of the development background. 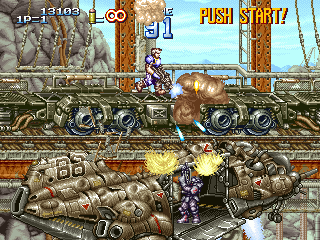 In fact many of the sound effects used in GunForce II were reused in Metal Slug, such as weapon samples and enemy voices. 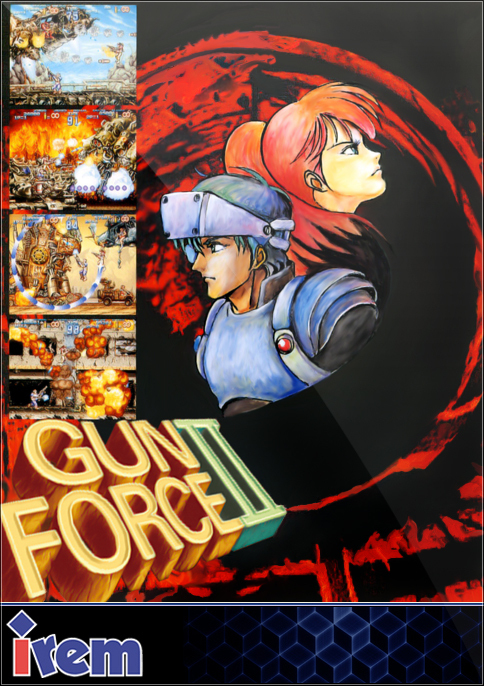 Another familiar face among the Irem production team was Takushi Hiyamuta, better known as Hiya, who composed the soundtrack to GunForce II and later to most Metal Slug games. GunForce II (Geo Storm in Japan) is a run 'n' gun video game developed and published by Irem Corporation in 1994 for arcades. It was Irem's last arcade game. This game was created by the same staff which would later form Nazca and is considered the spiritual predecessor to the Metal Slug series. 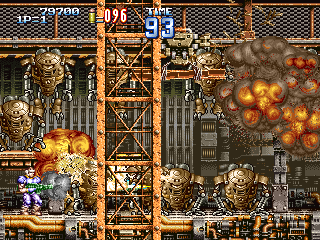 If you liked Metal Slug, you'll most definitely appreciate GunForce II as well. It has almost the same scoring system, the prisoner freeing feature, vehicles and the same screen-filling action from the popular run 'n' gun franchise. If you're up for a High Score Challenge, just send a PM to Merlin or Priest and they will happily set up a HSC thread to GunForce II. Don't be shy! Never played Gunforce but always thought it looked pretty good. Definitely has the Slug-style of art. The controls are stiff, the bullets are hard to see, and it fits the definition of a 'twitch shooter'. Although not a bad game, MS is definitely an general improvement over this series.